Textile products are an integral part of almost every commercial and consumer industry. Textiles are used in packaging, insulation, tire reinforcement, carpeting, upholstery, clothing, sporting goods, medical products, etc. Textile processing and finishing chemicals represent a $2.4 billion a year global industry. These chemicals, used in the processing of a variety of textile materials, are a vital determinant in the end product’s quality as well as the economy of the overall manufacturing process, including the disposal of effluents from the textile mills. This reference profiles more than 11,500 trade name and generic chemicals and materials used in textile fiber and fabric preparation, processing, dyeing, finishing, and effluent treatment. Coverage includes chemicals and materials that function as: Adhesives; Anticreasing agents; Antifoams; Antioxidants; Antishrinking agents; Antislip agents, Antisoaping agents; Antistats, Binders; Biocides; Bleaching agents; Carriers; Chelating agents; Coning oils; Corrosion inhibitors; Deaerating agents; Delustrants; Desizing agents; Dyeing assistants; Dye fixing agents; Dispersants; Emulsifiers; Fiber protectants;Finishing agents; Flame retardants; Foaming aids; Fulling agents; Leveling agents; Lubricants; Mercerizing assistants; Oil repellants;Optical brighteners; Oxidizing agents; Penetrants; Preservatives; Protective colloids; Reducing agents; Resins; Retarding agents; Scouring agents; Sequestrants; Sizing agents; Soaping agents; Softeners; Soil repellents; Solvents; Stripping agents; Thickeners; UV Absorbers; Warp sizes; Washing agents; Waterproofing agents; Water repellents; Wetting agents; Whitening agents. 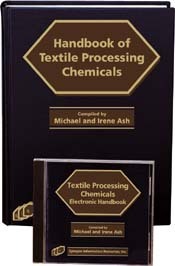 Both The Handbook of Textile Processing Chemicals and the software version are designed to function as a selection tool for deciding which is the most appropriate textile functional additive to use in formulation, processing, and waste treatment. This reference centralizes information on these currently available chemicals and materials from major manufacturers by profiling both trade name and generic chemicals, detailing their properties, uses, use levels, regulatory status, toxicology, sources for purchase, etc. Trade Name Reference provides an alphabetical listing on more than 8700 trade name chemicals and materials that are used in formulations requiring lubrication as a key or ancillary function. Each entry includes the manufacturer's name; chemical/material description; its detailed functions and applications in all aspects of industry; physical properties, such as form, molecular weight, density, solubility, boiling point, cloud point, flash point, pH, freezing point, activity; toxicology, storage, precautions, etc. Chemical Component Cross-Reference covers more than 2700 chemicals and materials that are contained in the trade name products profiled in Part I or generic chemicals that are not linked to trade names but are used in textile processing chemicals. Each entry contains information including the following: CAS (Chemical Abstract Service), EINECS/ELINCS (European Inventory of Existing Commercial Chemical Substances/European List of Notified Chemical Substances), and UN/DOT reference numbers, classification, definition, chemical synonyms, empirical and molecular formulas, properties, toxicology, precautions, storage, uses, use level, regulatory details, manufacturers and distributors. All chemical/material synonyms are cross-referenced back to the main entry. These entries/ are followed by a listing of the trade name products that are either equivalent to the monograph entry or contain it as one or more of its ingredients. Functional/Application Index is a powerful tool for locating the trade names and chemicals based on their function and/or industrial application area. By searching for key functional words related to textile processing such as emulsifier, fixing agent, flame retardant, optical brightener, scouring agent, and specific application areas such as fabric finishes, dyeing, warp sizes, fiber lubricants, etc., the user is directed to the trade names and/or chemicals that have that specific functional/application attribute. The generic component names are distinguished from the trade names by italic type in the book and color in the software. Detailed contact information for the more than 2000 worldwide manufacturers and their branches of trade name products and chemical components that are referenced in this handbook. Wherever possible, telephone, telefax, toll-free numbers, e-mail and internet addresses (functional in the software), and complete mailing addresses are included for each manufacturer. Glossary contains definitions of terminology associated with textile processing chemicals and their application areas.